Almost three centuries ago, in A Modest Proposal, satirist Jonathan Swift suggested that poor children in Ireland should be fattened up for a year and sold as food. This would spare families years of expense, provide them some income, enhance the upper crust's dining experiences, and improve the nation's economy. 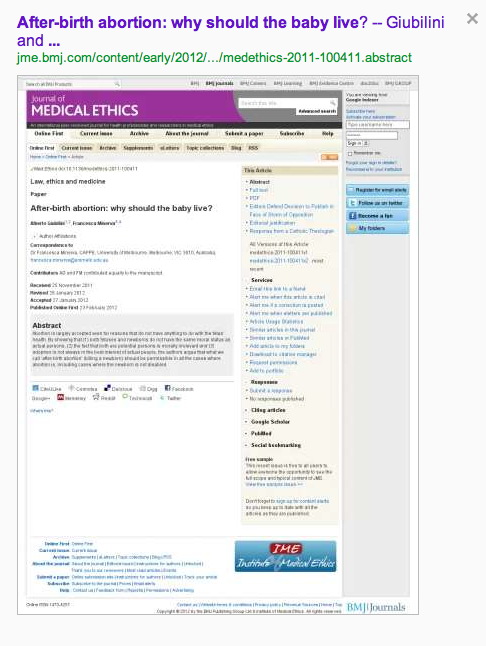 Given the long-lasting fame which came to Swift as a result of this work, I figured that Alberto Giubilini and Francesca Minerva, two Australian writers who somehow convinced the UK's Journal of Medical Ethics (JME) that they are "ethicists," were surely attempting a similar exercise in Juvenalian satire in their February 23 paper titled "After-Birth Abortion: Why Should the Baby Live?" An examination of 18 European registries reveals that between 2005 and 2009 only 64% of Down's syndrome cases were diagnosed through prenatal testing. This percentage indicates that, considering only the European areas under examination, about 1700 infants were born with Down's syndrome without parents being aware of it before birth. The fact that many of the parents of the other 36% might in otherwise stable circumstances have chosen to end the pre-born baby's life if only they had known of the baby's handicap is far from the only problem. Sometimes the mother's life situation changes for the worse, and what was expected to be a bundle of joy has become a serious encumbrance. ... to bring up such children might be an unbearable burden ... on society as a whole, when the state economically provides for their care. On these grounds, the fact that a fetus has the potential to become a person who will have an (at least) acceptable life is no reason for prohibiting abortion. One must admit that as satirists, the two Aussies really rock. ... we propose to call this practice "after-birth abortion," rather than "infanticide," to emphasize that the moral status of the individual killed is comparable with that of a fetus (on which "abortions" in the traditional sense are performed) rather than to that of a child. Therefore, we claim that killing a newborn could be ethically permissible in all the circumstances where abortion would be. Such circumstances include cases where the newborn has the potential to have an (at least) acceptable life, but the well-being of the family is at risk. ... The alleged right of individuals (such as fetuses and newborns) to develop their potentiality, which someone defends, is over-ridden by the interests of actual people (parents, family, society) to pursue their own well-being because, as we have just argued, merely potential people cannot be harmed by not being brought into existence. Giubilini and Minerva are absolutely brilliant, aren't they? Through their satire, they make incredibly powerful pro-life arguments. Over forty years of reason-based attempts at persuasion and breathtaking improvements in science and technology affirming the wonders of human life at all stages have failed to prevent the annual slaughter of a million-plus children in the U.S. from abortion on demand. But now, in points bluntly made and sharply executed, the two Aussies have found the key. After reading their work, nobody can possibly believe that children, once born, are not entitled to continue to live. Once readers are reminded of that obvious point, they'll reach the inescapable conclusion that "pre-birth abortion" is every bit as evil as "after-birth abortion."